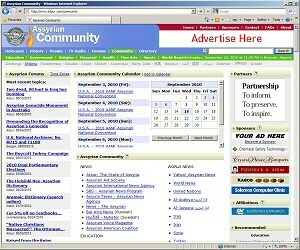 which hosts and develops the following websites. 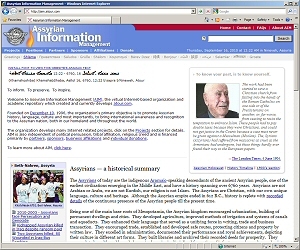 AIM is an Internet-based academic repository of the Aramaic-speaking Christian Assyrians in the Middle East, documenting the national struggle for our Assyrian homeland and statehood. Religious persecution and ethnic genocide of Assyrians in the Middle East. 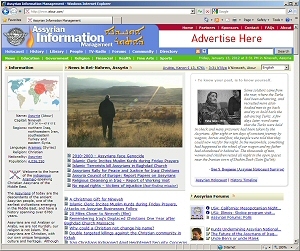 Armenian, Assyrian and Hellenic Genocide news and information is a joint development effort of Armenian, Assyrian and Greek activists, and is managed by AIM. 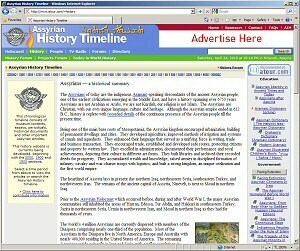 Chronological timeline which consists of essays, museum contents, historical documents and other important Assyrian articles. 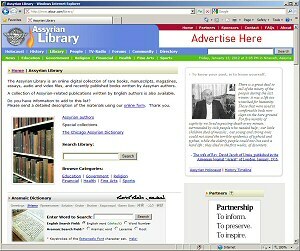 The Assyrian Library is an online digital collection of rare books, manuscripts, magazines, essays, audio and video files, and recently published books written by Assyrian authors. A collection of Assyrian-related publications written by English authors is also available. Do you have information to add to the library? Please send a detailed description of the materials using our online form. Thank you. 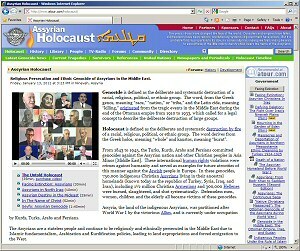 A comprehensive archive containing biographies of Assyrian people. 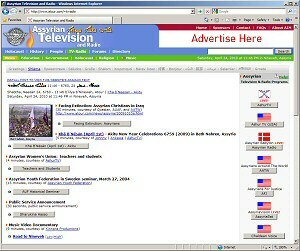 Television and radio programs from Nineveh, Beth-Nahren (Assyria), home of the indigenous Assyrians. 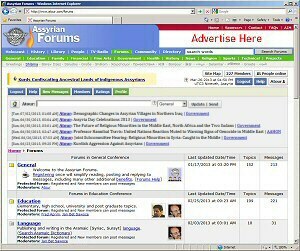 The Assyrian Forums are online discussion forums consisting of various categories of subjects. For detailed information, browse the forums' frequently asked questions FAQs and Reference Guide. Please follow the registration requirements and instructions to successfully create an account to access, post and share your viewpoints with others at the Assyrian Forums. 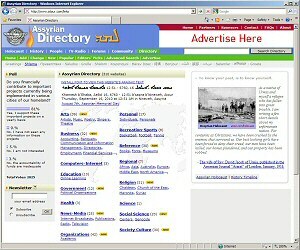 The latest community news from the Assyrian Forums and websites worldwide, including international news. 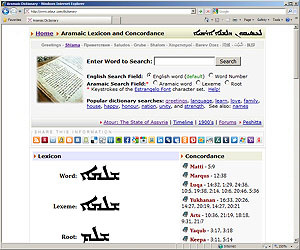 Search the online Aramaic dictionary using English or Aramaic words, including many other options. 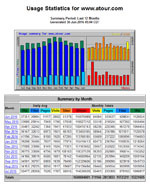 The virtual Internet-based organization and academic repository which created and currently develops atour.com. 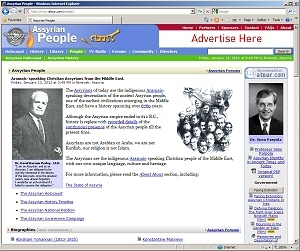 The Assyrian American National Federation (AANF) Convention hosted in San Jose, California in 2001. The most well-organized and profitable convention in the history of the AANF, was managed by Jacklin Bejan and utilized a complex online registration process to manage the four-day event using the resources of Assyrian Information Management (AIM). or visit the information section to learn more about this website.